Looking for a hidden beach with perfect white sand and turquoise waves? 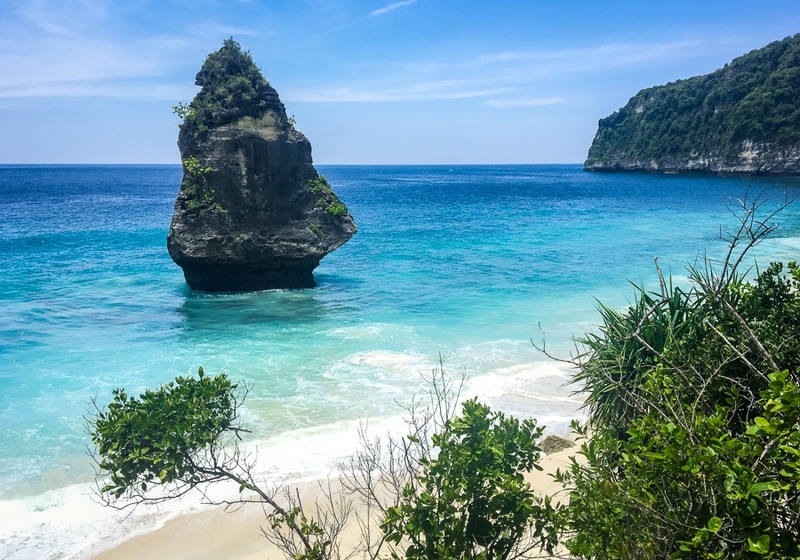 Suwehan is one of the nicest beaches in Nusa Penida island, and also one of my favorite places in all of Bali. There’s even a cool pointy rock that looks like a Christmas tree, or maybe an elf hat. When I first visited Suwehan in 2017, it was almost a completely unknown spot. The hike down to the beach involved walking down a steep rocky staircase and then climbing down a sketchy vertical rope for the last section of the hike. The rope section might be a bit unnerving for some people (and was for me), because you never know how secure it is; but hopefully the trail condition will improve soon and a better path will be added. The hike down takes about 30 minutes and it’s exhausting, but totally worthwhile. In late 2018, a new tree house was built at the top of the cliffs at Suwehan. You can stay the night in this tree house, but I’m still working on getting the details. Coming soon! Suwehan Beach is on the south side of Nusa Penida island. It’s accessible by car or scooter, about 1 hour drive from the main docks and accommodation in northern Penida. Warning: In August 2018, the foot path down to Suwehan was damaged in a landslide (apparently due to the Lombok earthquake), and Suwehan Beach is very difficult to reach. This info is current as of November 2018. Hopefully the situation changes soon.